MyMemories Blog: Meet this week's Featured Designer - *Sugar Moon Designs*!! Meet this week's Featured Designer - *Sugar Moon Designs*!! Happy Monday!! It's time to introduce another amazing MyMemories Designer! This week we meet Crystal at *Sugar Moon Designs*!! She is excited to show some of her amazing designs off this week and has a GREAT 35% off sale going on in her shop! Be sure to check it out! I think everyone has an important story to tell. And she's has $25.00 shopping sprees to her shop up for grabs for FOUR LUCKY DUCKS, so be sure to comment below and let her know what YOUR favorite kit is in her shop! Be sure to check out her blog and FB page so you don't miss ANY of the fun!! Birthday Bash and Robin's Song are my favorites. Another year wiser is my favorite. Too many to choose from. Birthday!! Your writing talent sounds amazing! I like Christmas Pageant and Swimmingly. I love your kits ...they are all amazing! My DD loves superheroes so I'm choosing Superheroes vs Monsters and Swimmingly ... cuzz she loves to swim. Thank you for the chance! Okay, there is no way I can choose just one favorite. LOL I like Swimmingly, Lillypads & Lightning Bugs, and Summer Afternoon. Animal Cracker is absolutely adorable! Thank you so much for the chance! Love all of Sugar Moon's Kits! she's an awesome designer! I love her Another Year Wiser kit! so adorable! thanks for the chance! vintage Tea party so cute and who doesn't love a good tea party to visit? Summer Afternoon -- what cheery looking bumble bees...and I love that big daisy. I love the Celebration kit! It is so colorful and fun! Hi,I just love butterflies so my favourite is Vintage tea party razzle dazzle but with the summer on its way here in South Africa - summer sorbet will be on my wish list. Thank you so much for this post. 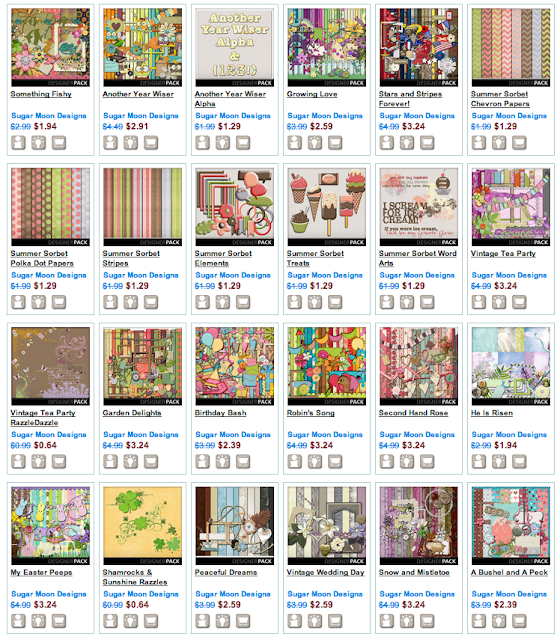 I want to let you know that I posted a link to your blog in CBH Digital Scrapbooking Freebies (please, notice the new url for my blog), under the Page 4 post on Sep. 04, 2012. Thanks again. I love the animal crackers kit! So cute!! so many cute kits! Thanks for the chance to win one. I like second hand rose, christmas by candlelight and snow and mistletoe. Swimmingly is a wonderful kit! The papers are fun and the elements are bright and pop from the page. I Already Have "Growing Love" But If I Have to Pick Just One Other...I Would Have to Say "Second Hand Rose"...I Just Love The Colors,The Hearts & The Lovely Roses!...Also,The Pretty Papers Look Like A Wonderful Compliment To The Rest Of The Kit! My favorite kits are Christmas Pageant and Five Little Monkeys. Well, there's so much that I love, but I'm really feeling 'Attack of the 50ft Woman' right now! Thank you so much for the chance to win! I love Sweet Strawberry Patch! Her designs are amazing and love them all. If I had to choose one, it would be Christmas by Candlelight, the colors are stunning. Thanks for the chance! Robin's song is great, so cheerful and full of colour. Summer sorbet would be exciting to design with! Great stuff!!! I love love the Garden Delights kit! So cute! I like the Summer Sorbet kit. Especially like the embellishments, and the striped and polka dot papers. Just love Garden Delights and all of the Summer Sorbet kits :) Thanks for the chance!! I love the ice cream word art - great! !